This is an amazing primer, especially if you don't have oily skin (and you are willing to apply your foundation quickly.) It acts like a double sided tape and HOLDS onto your makeup. The staying power of this primer is fantastic even on oily skin (which tells you something!) This primer does nothing to control oil throughout the day, however even with your skin glistening with oil, your makeup will not move. For $32/$38 (USD/CDN) you will get 15.5 grams of product presented in a cylindrical twist up container, which I must say is fantastic packaging. 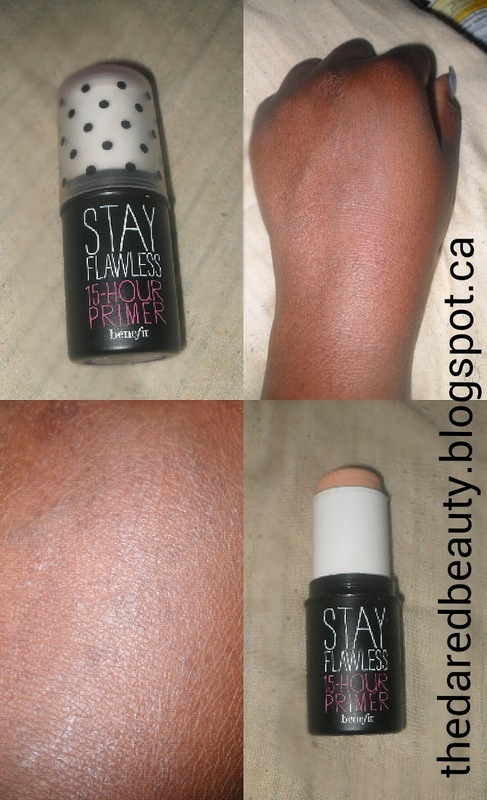 Tips: Ensure you follow with your foundation quickly since this product does dry fast. As soon as your rub this stick primer onto your face proceed with your foundation and blend the two together for a flawless application. I focus strictly on the problem areas (forehead and cheeks) to ensure a flawless yet natural look to my face. Pros: This primer works fantastic to fill pores and fine lines-see picture below, therefore giving the appearance of flawless skin. Very cute girly packaging. It does allow my makeup to last hours, approx. 9 hours on my oily skin. Cons: This product does not oil control, therefore I find that I have to layer my primers. If you are of a deeper skin tone, you may find that this primer leaves a grey cast over your skin and therefore ensure your blend blend blend. The drying time on this primer is quick, so you have to ensure that you work quickly when applying your foundation or it (the foundation) will not apply smoothly. Final thoughts: Overall it does not work best on it's own with my skin tone (deep) or type (oily) and therefore forces me to layer primers. If foundation is applied after primer has dried, your makeup will look cakey and will not blend well. I like to take my time when doing my makeup so having to rush through applying foundation can be irritating. For the price point on this product, it is good but not great.